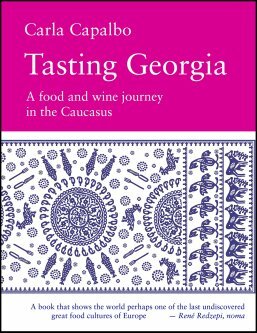 This is Carla Capalbo’s Tasting Georgia – A food and wine journey in the Caucasus, hardback, Amazon price is just over £20. It is published by Pallas Athene, and will be available from 6th June. So in the sense that this book has not been published yet, this is more of a preview than a review. It is also a preview in the sense that it is based on a mere 2 hrs or so perusing an almost-final PDF version of the book – sadly I find it hard to read on-screen for longer periods of time. Firstly, I was struck by the photography, which is also Carla’s work. It is of a very high standard, and the images nicely complement the text to give a feeling for the country and its food and wine. Many of them impacted me emotionally, reflecting the beauty and often-gritty reality of the subject matter. I have recently returned from a visit to Georgia, and my impressions are captured by Carla far better than my own inadequate photographs. At a much more prosaic level, it was also nice to see locations, faces and dishes I recognised. After a general introduction to the country’s history, wine and food, with emphasis on the food, Carla devotes each major section of the book to a particular region. Each starts with a map and introduction, followed by a number of sections devoted to specific entities in the region – villages, restaurants, food shops, cooks, winemakers and, notably, recipes. There are 70 recipes in total throughout the book, each one attractively presented in a very practical way over a double-page spread, one page to illustrate the dish, the facing page describing how to make it. The book smacks of good solid, almost classical, design. It is nicely presented in terms of structure and illustrations, and reads very well. A common bugbear of mine is the quality of the mapping in wine books, but I have absolutely no complaints on that score with this book. I could easily imagine going through it linearly from cover to cover, without the annoyance of boxes and side-bars to break the flow, and yet the division of the text equally supports diving in to take one section at a time. Finally, it has a comprehensive index. Two in fact, as there is a separate recipe index and meal planner. Am I getting over-excited by the presence of an index? It is something one should expect in a book of this type, but increasingly it is a feature deemed expendable by publishers, and one I miss if absent. As I am writing on a wine blog, I would add just one note of caution. If you buy this book only for information about Georgian wine you could be disappointed, as Tasting Georgia is certainly no comprehensive guide to its wines and producers, and neither does it claim to be. Nevertheless, I am sure many wine lovers – especially those with foodie tendencies – will find a great deal of interest here. So, as I said, this is a more preview than a review. I am not sure if I have convinced you about the book, but I have certainly seen enough to know want a paper copy for myself so I can read it properly. In the meantime, I shall be describing my personal experiences of Georgia over the next few blog posts here, so if you are interested in the country please keep in touch. Update 02/06/17: Carla has added a comment to this post that I think you will find worthwhile reading – some background to the book, her approach to writing, and more about the wine-related sections. Update 28/11/17: Just a note to say that since writing the above preview, I have read the physical hardback book in detail, some parts more than once, and have also used a few of the recipes. My respect for the book has only grown, and I still agree with everything I wrote above, though I have just made a few very minor changes, including changing the RRP to an online price. I do however fear that my comment about the book not being a “comprehensive guide to its wines and producers” comes across as too negative. It was not meant to be; but just an indication that it does not follow the standard pattern of wine books, with sections on grape varieties, major producers, and tasting notes. On the other hand the book does cover artisanal qvevri wine production in considerable detail, and profiles many wine producers of that type. I should also point out that I obtained the physical book as a review copy from Carla, but already I have also put my money where my mouth is, and bought a copy of it as a present. This entry was posted in General and tagged book, food, georgia. Bookmark the permalink. Many thanks for this lovely review. I notice towards the end that you have not had that much time yet to fully read it — understandable as you haven’t had a chance to see it as a book yet and it’s 464 pages long! — but I did want to add something about the wine coverage in the book as yours is such a good wine site. My first visit to Georgia in 2014 was due to my interest in the qvevri wines (made in the large terracotta vessels the Georgians have been using for over 8,000 years to make their wines) that I had first come across at Josko Gravner’s when I was writing my Collio book in Italy’s Friuli. I fell in love with these amazing pots and the wines. So my book is pretty equally divided between wine and food (at least 40% is wine-driven), and my idea was to visit as many of the small wineries who today bottle their qvevri wines as I could and write about what I found. That ended up being 37 producers (the most important vignerons in Georgia, as opposed to the large commercial wineries). In each case I interviewed the people and gathered their stories about the qvevri tradition (including what went on in Soviet times, etc) and about themselves and their families. My focus in wine writing, whether for Decanter Magazine where I have been a contributor for over 15 years or in my many books, has always been on the culture of winemaking, and on what it means in today’s world to make wine or produce food. I’m less interested frankly in wine tasting notes and not at all in scoring (I have never put a number on anything or anyone since I started writing books!). For me the point of writing these complex and time-consuming books is to gather the oral histories of today’s workers of the land, and each of their stories reflects their personal choices and situations. I’ve made maps and charted their positions around the country to help others find them and visit them too (so Tasting Georgia is also a guide book). Often the recipes in the book have come out of these meetings. In this book I’ve also focused a lot of attention on the qvevri way of winemaking, and have given detailed information about how the qvevri are made, fired and waxed, and about the different ways people use them to make wine. Georgia can boast 525 native varieties of grapes too, and the book also focuses on the efforts, since the fall of the Soviet regime, to rebuild this extraordinary example of biodiversity. So the reader can find as much information as currently exists about that too, and about the amazing research institute at Saguramo where the national collection of grapes is preciously cultivated. Ok, that’s it! I just wanted to complement what you had written from the point of view of someone (that’s me!) who knows all too well what this book comprises!